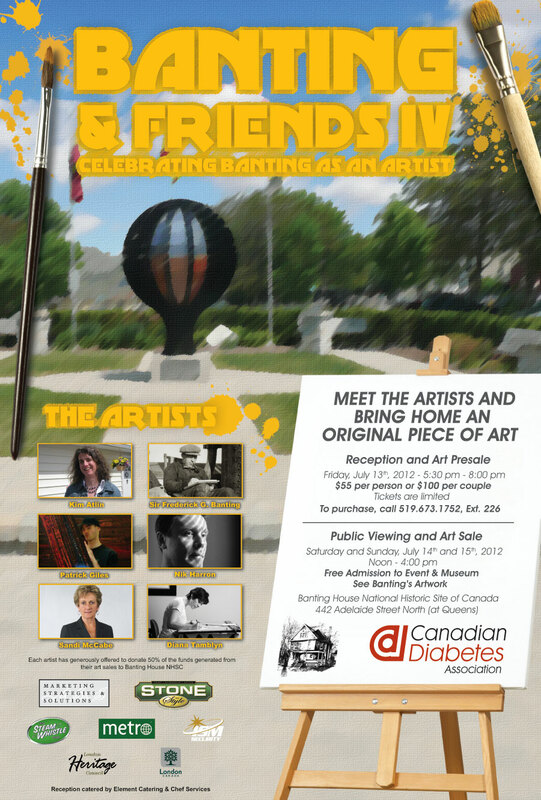 Here’s some more information on Banting & Friends IV. It is being held this weekend; July 13-15. For details, keep reading or check out our events page. London, ON (July 13, 2012) – Banting House National Historic Site of Canada hosts Banting & Friends IV, a fundraiser made possible by London and area artists who embody the spirit and passion of Sir Frederick Banting and his support of Canadian art. Artists will display their original works of art in Sir Frederick G Banting Square with 50 per cent of all sales supporting the Museum. A private preview and evening reception will kick off the event on Friday, July 13 from 5:30 p.m. to 8 p.m.; tickets are $55 per person or $100 per couple. The public event and viewing take place on Saturday and Sunday, July 14 to 15 from 12 p.m. to 4 p.m.; admission is free and includes free admission to Banting House. Both events take place atSir Frederick G Banting Square at442 Adelaide Street North inLondon,Ontario. Sir Frederick Banting’s artistic talents are a little-known aspect of his brilliant and diverse career. As a struggling doctor inLondon,Ontario, he turned to his art to pass the time. Later, it would serve as an important escape mechanism from the pressures associated with being an international hero. At the time of his death, his portfolio numbered more than two hundred works. Banting House National Historic Site of Canada located inLondon,Ontariois a public site dedicated to presenting national historic significance of Sir Frederick Banting and preserves the commemorative integrity of Banting House, the birthplace of insulin. Please visit diabetes.ca, join us on facebook.com/BantingHouseNHS, follow us on Twitter @BantingHouse, or call 519-673-1752 x 226. Across the country, the Canadian Diabetes Association is leading the fight against diabetes by helping people with diabetes live healthy lives while we work to find a cure. We are supported in our efforts by a community-based network of volunteers, employees, healthcare professionals, researchers and partners. By providing education and services, advocating on behalf of people with diabetes, supporting research and translating research into practical tools – we are delivering on our mission. For more information, please visit diabetes.ca or call 1-800-BANTING (226-8464).